Master your course with the practice and hands-on-activities that will help you get ready for the medical office. 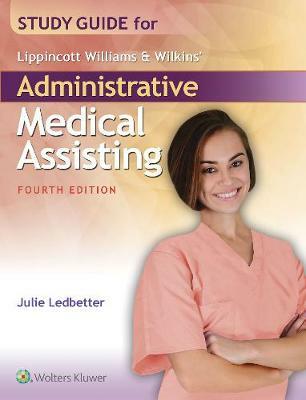 In this new edition of Study Guide for Lippincott Williams & Wilkins' Administrative Medical Assisting, the exercises and activities align with the American Association of Medical Assistants (AAMA) curriculum standards. The Study Guide aligns to the textbook and includes exercises that reinforce the knowledge and skills required of all Medical Assistants. Take advantage of the following when you add this guide as a study tool: - Practice Questions in A Variety of Formats - No matter your learning style, you can reinforce you learning and get ready for course success. These formats will help you retain new information, reinforce previously learned content, and build confidence. - Case Studies for Critical Thinking -These scenarios and questions are designed with real-world situations in mind and are intended to promote conversation about possible responses, not just one correct answer! In short, these studies can help you get ready for what you will face in the real world. - Procedure Skill Sheets - Every procedure in the textbook has a procedure skill sheet in the Study Guide to help you practice and evaluate your learning.